You know that old adage; that which doesn't kill you makes you stronger. I loved this saying and frankly I used to live by it. Then you realize that it's just a sham and what it should be is: that which doesn't kill you makes you think you're not dead and reborn over and over and over again. Knowing my weird penchant for privacy, I may not even post this post until I'm out of it. All I know is, everything is currently a whirlwind. I'm getting more offers to perform now than I have ever received in the past and regrettably I just have no time to even attend rehearsals. 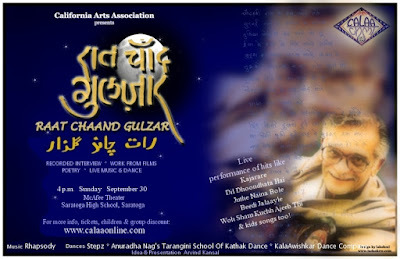 A show recently came up though; luckily AFTER August (Jupiter Retrograde, you kill me) and is allowing me to finally explore the works of one of the loves of my life: GULZAR. I have been fortunate enough to be allowed to take part in this wonder venture. Please stay tuned as I post updates about rehearsals. No more time for audio posts. good to know people are keeping up Gulzar sahab's legacy! I almost met him last year in Bombay, but due to time constraints, it didn't work out. Although in pas few years I have studied and delved into works of many urdu poets from 1800 Meer, Sauda to present day Faakir, Fazli etc. Gulzar does have his own niche, more due to his simple writings and ability to pour a common person's life thru his words.